With the Bohemian Garden design only in hindsight do I see all of the layers that worked together as inspiration – a chance meeting with one of my textile heroes, Natalie Chanin, while filming at Craftsy; new bold prints making their way into everyday fashion; and notably, the iconic paper cut-outs created by Henri Matisse. So here's my challenge to you. 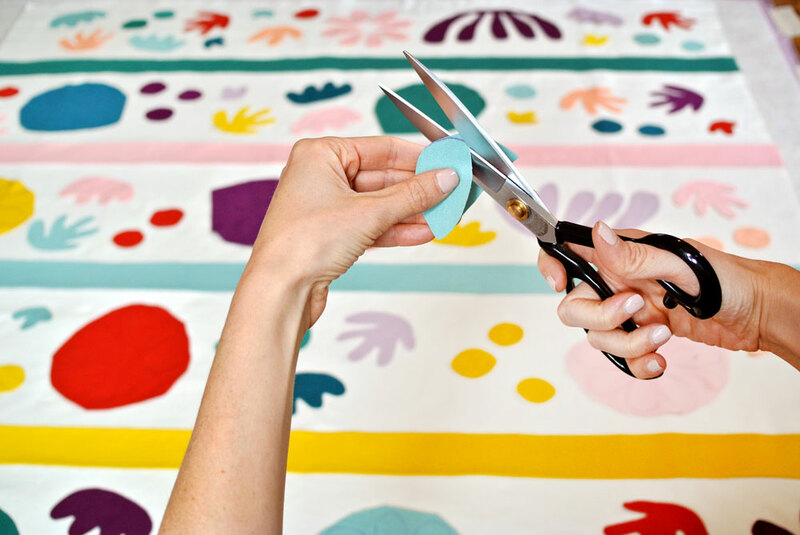 If you've never tried appliqué. Try it. If you've never sewn with knit. Try it. You don't have to make this pattern. 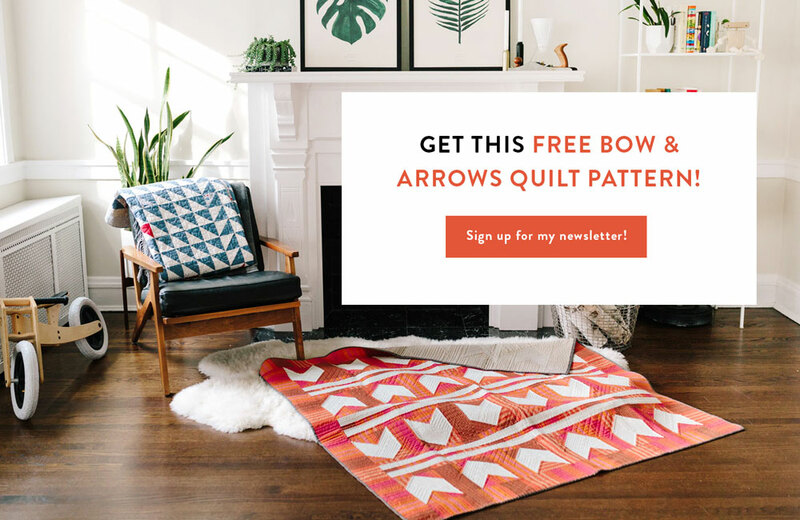 You don't even have to make a pattern at all! But I'm guessing, you won't regret trying something new. 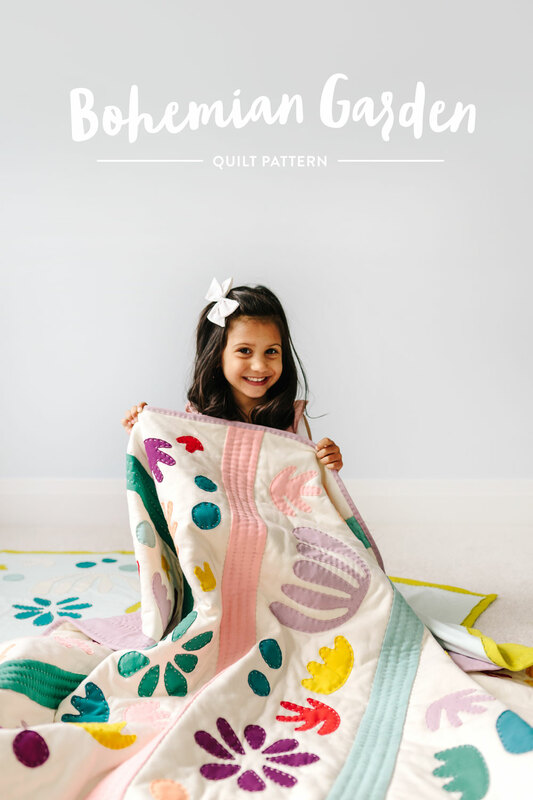 Before diving into the nuts and bolts of the Bohemian Garden quilt pattern, check out this video series I created to show you step-by-step how to make a quilt using knits. This video shows you how to make a whole-cloth, but the same principles can be applied to all knit variations! 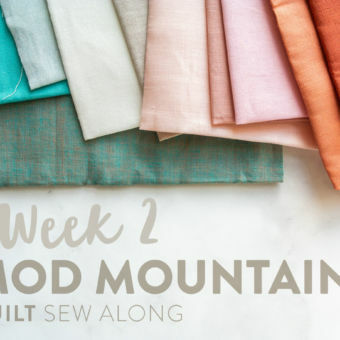 Choose your own adventure – the pattern includes 3 variations! 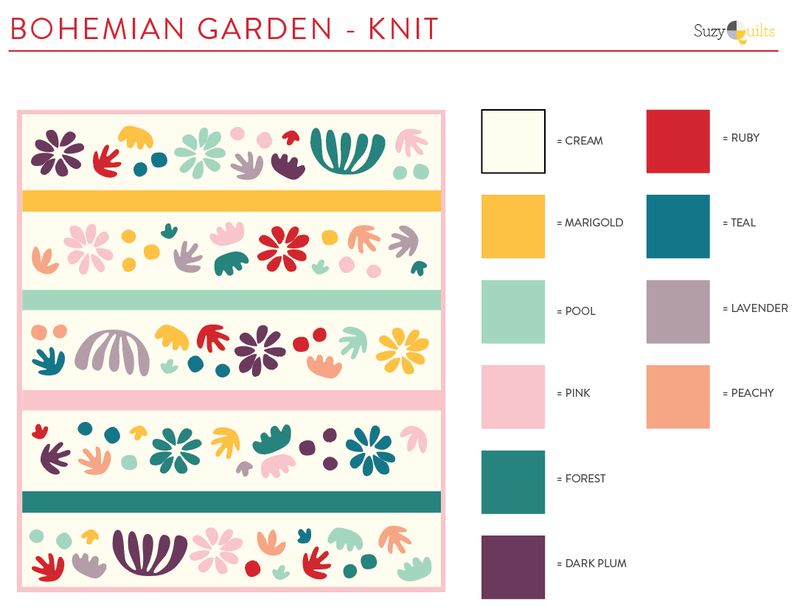 I originally made the first version of Bohemian Garden using all knits, but you know what's just as cute? 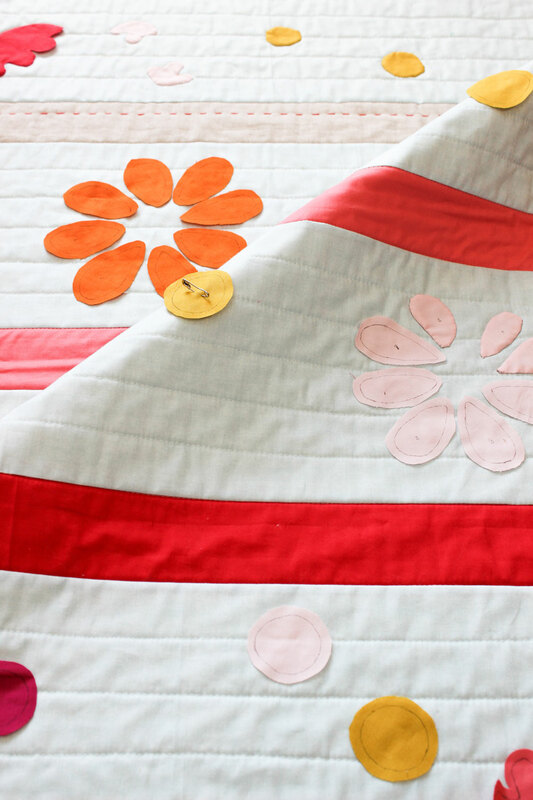 Using your classic quilt-weight cotton that you already have on hand. 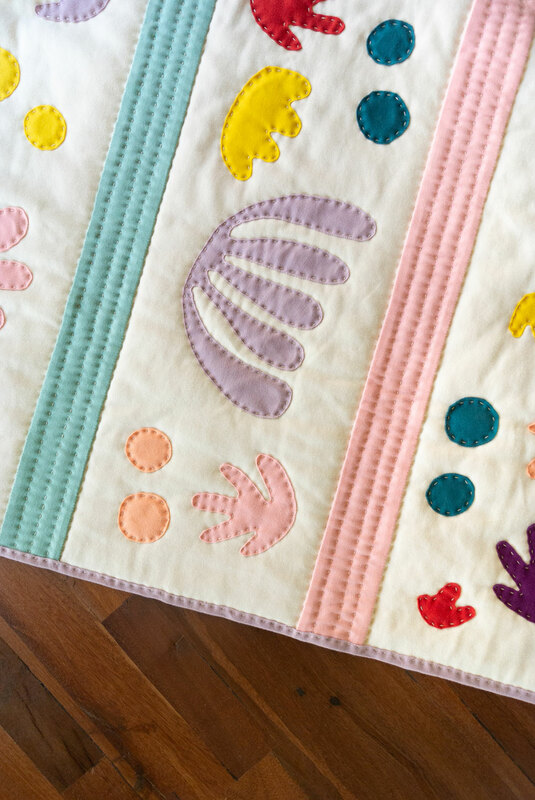 The pattern includes instructions and illustrations on how to quickly and easily recreate this design using raw-edge appliqué. 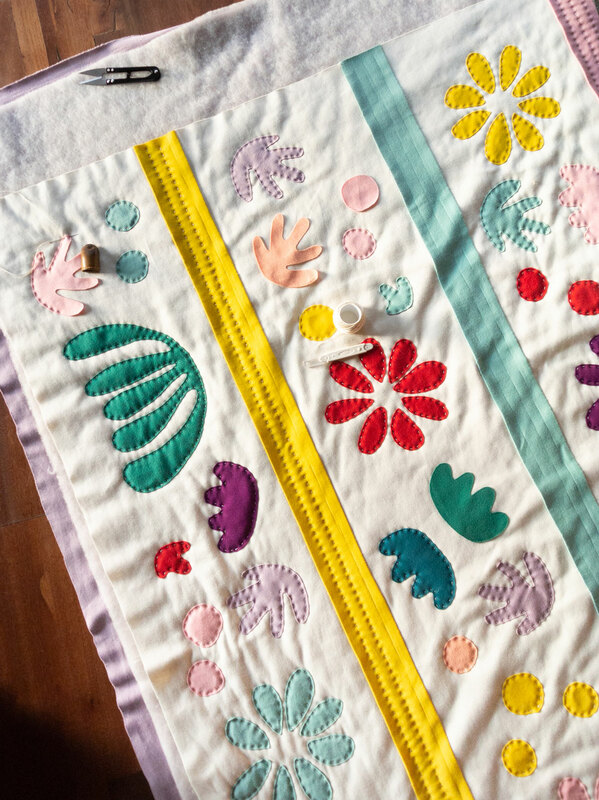 Don't believe raw-edge appliqué is easy peezy? Check out this tutorial! 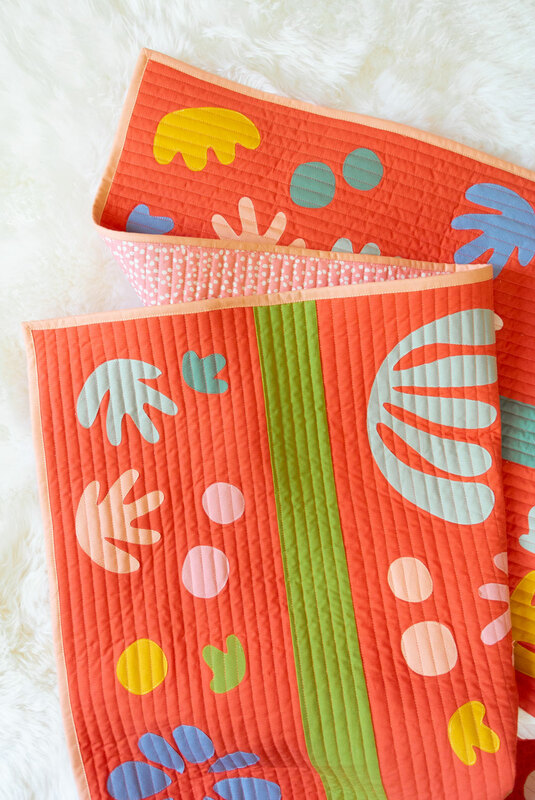 Make the Havana Boho Garden Quilt! 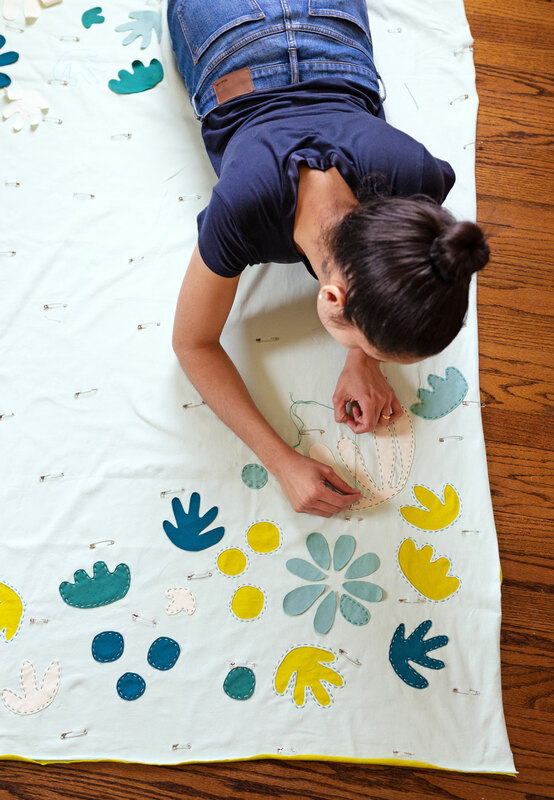 There are different ways to appliqué, so choose the technique that is right for you. 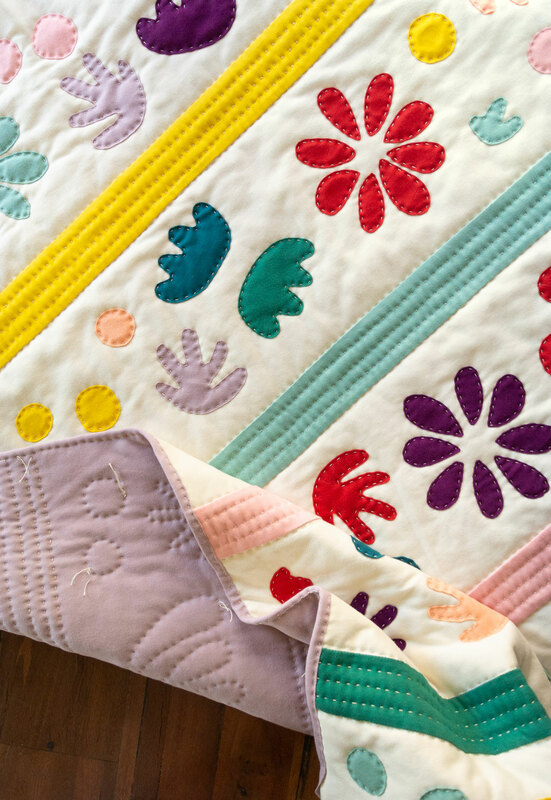 The pattern includes instructions on making this quilt using raw-edge appliqué. 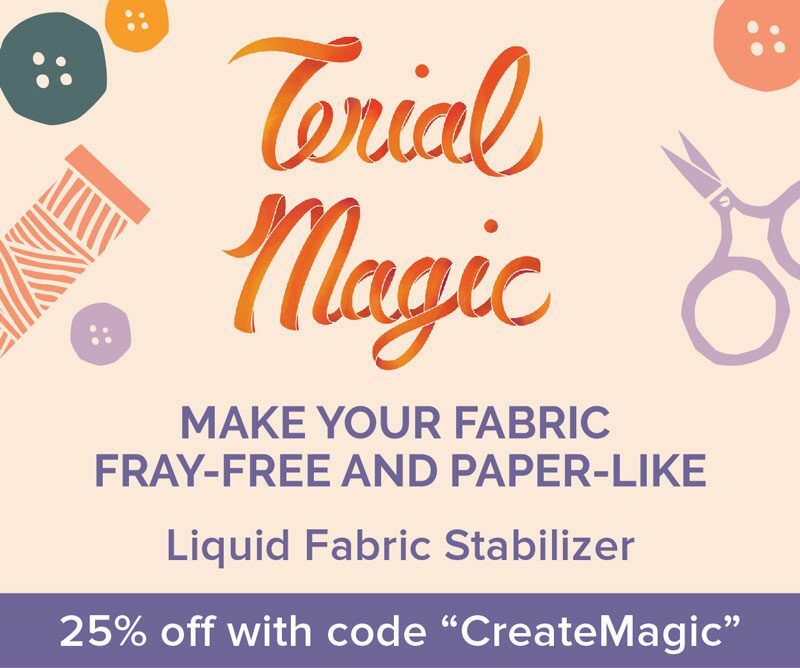 The only bit of extra supplies you need is fusible web. I use Pellon 805 Wonder-Under. It's inexpensive and easy to use. I've also heard that Heat-n-Bond Thermoweb works well, but can't speak from experience. I like the Dritz Dual Purpose Marking Pen because it glides easily over all kinds of fabric. 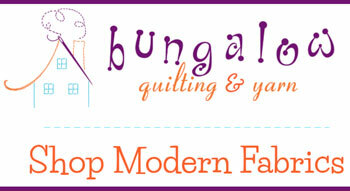 You can choose the light blue color or dark purple based on which one is easier to see on your fabric. 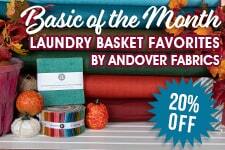 All of the fabric used to make this version is 100% organic Birch Fabrics poplin. A question I get sometimes is, "Is poplin the same as cotton? 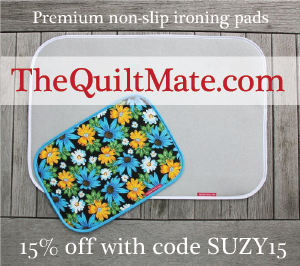 Can I use it to quilt?" In this case, the answer is Yes and Yes! 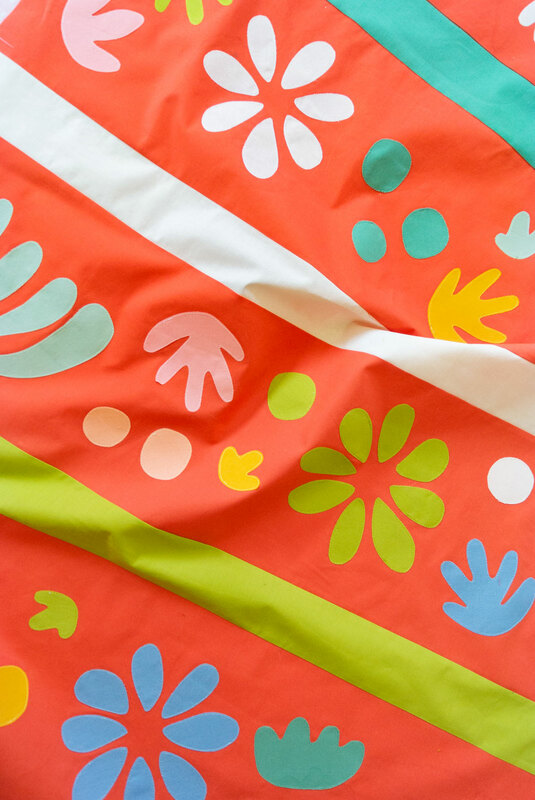 This poplin is a light-weight solid cotton fabric that is great for piecing and quilting. 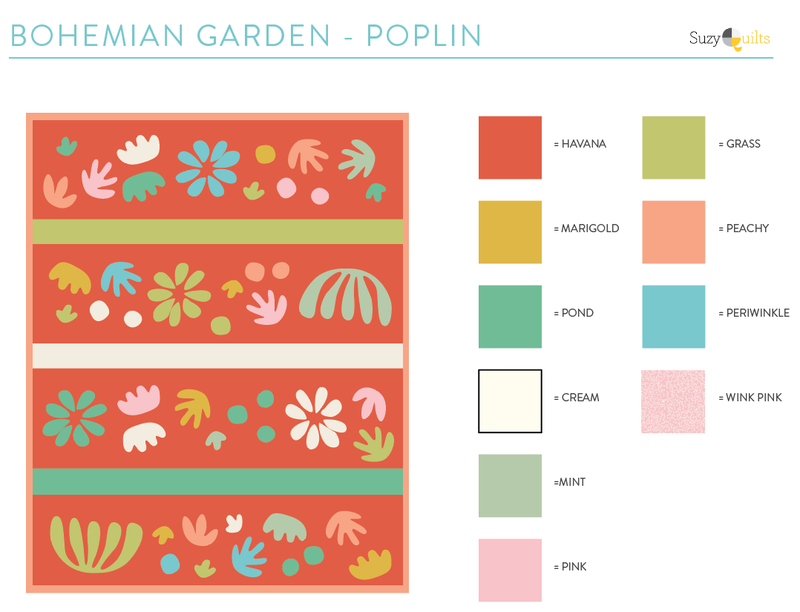 Read more about sewing with poplin here! You can find these specific fabrics at fabricworm. 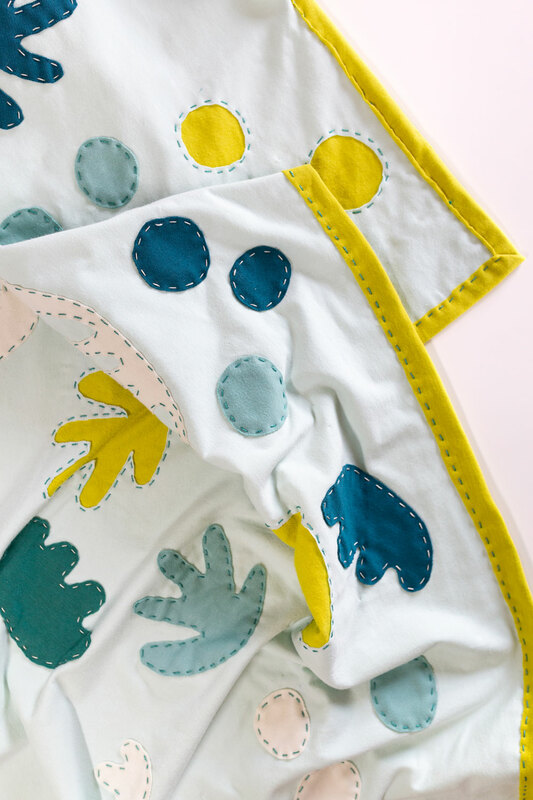 And if you're a big fan of the Pop Dots fabric like me, it's currently on sale here! 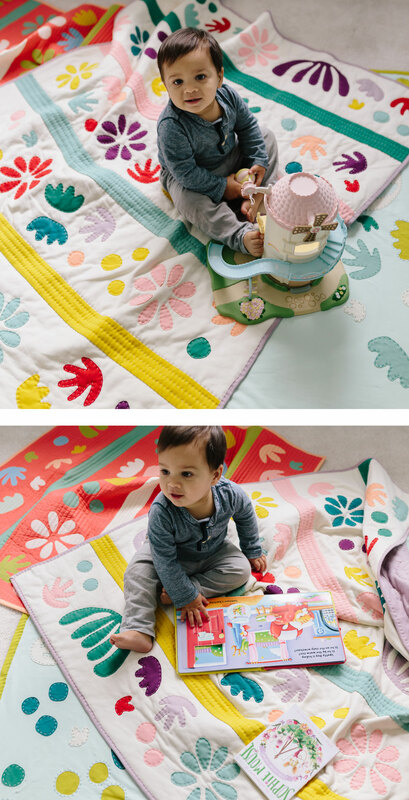 Make the Softest Quilt in the World with Knits! 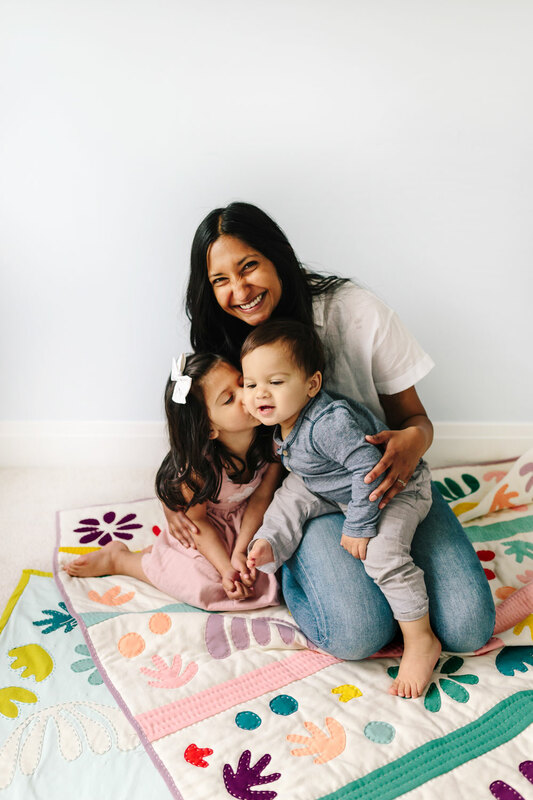 Knits, unlike our classic quilt-weight cotton, are not woven with vertical and horizontal threads. You can see in the image below the difference between the looping knit stitches and woven stitches. Woven fabrics unravel easily. Knits, however, do not, so the edges can actually be left raw without any trouble. Did you hear that? RAW. Can you think of what would be soooo fun and easy if fraying didn't happen and all edges could be left raw? I snapped the above shot while I was having the loveliest moment hand sewing as the sun set. 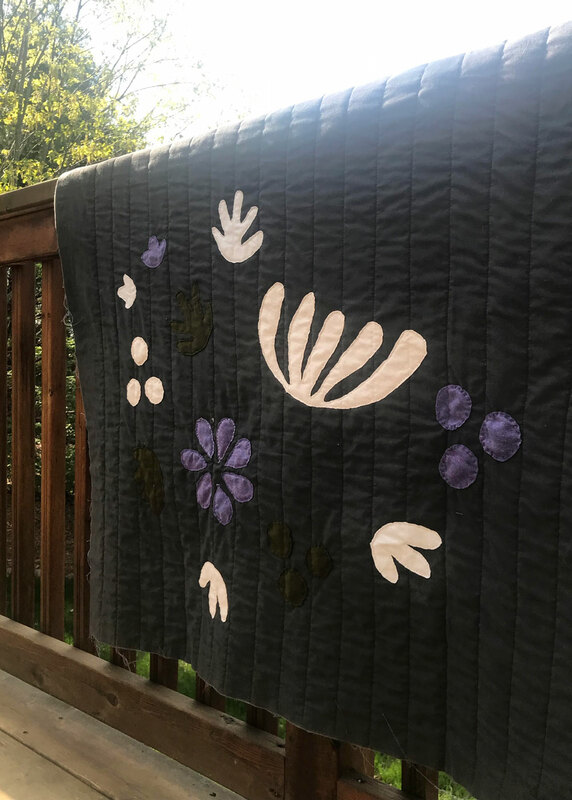 I've been hand quilting for a couple years now, and believe it's a great way to connect with the process of making, meditate, and slow down from the speed and urgency life imposes on us. I'm smitten, you could say. 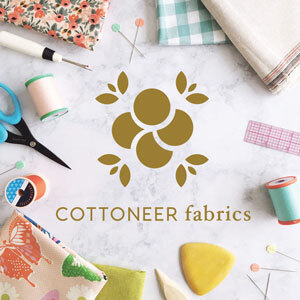 So member 10 seconds ago when we jumped up and down cause we were so excited about appliquéing all the things with knit because it doesn't fray? Well that's not the only thing we should be excited about. Because of the no-fray factor, we can also shortcut our binding by folding over the backing and sewing that to the front. Voilà! How pretty is that? Sidenote: I know you're wondering about the knot ties. You're thinking, "Did she do that on purpose?" And the answer is, "Yeppers!" When hand quilting I usually pop my knots so they are invisible, however this time I thought, let's try it and see what happens! I posted this to IG and the results were pretty divisive. Some of you hated it and some thought it was groovy. At the end of the day, whatevs! It's fun trying new things! 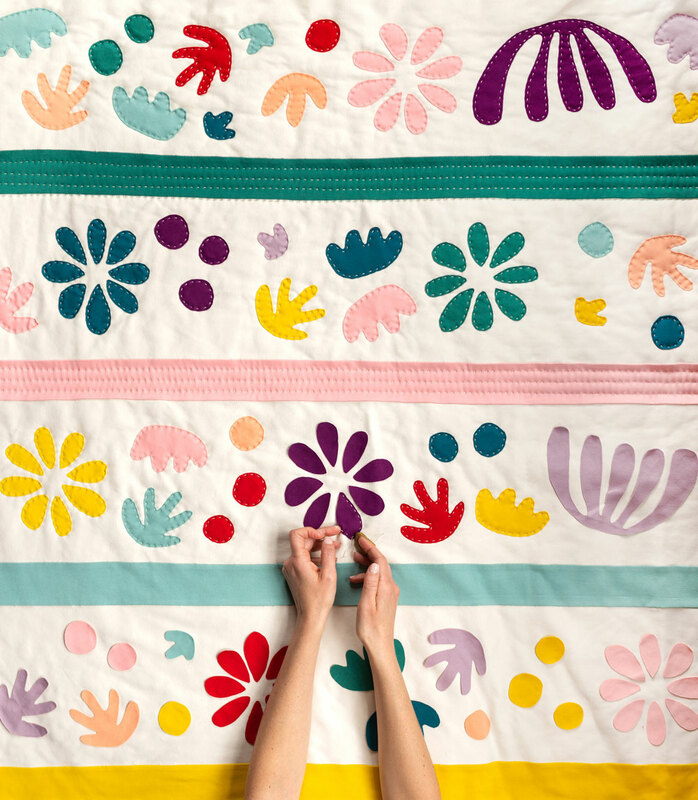 In this Bohemian Garden knit quilt I used 100% organic Birch Fabrics knit. You can find most of them at fabricworm. 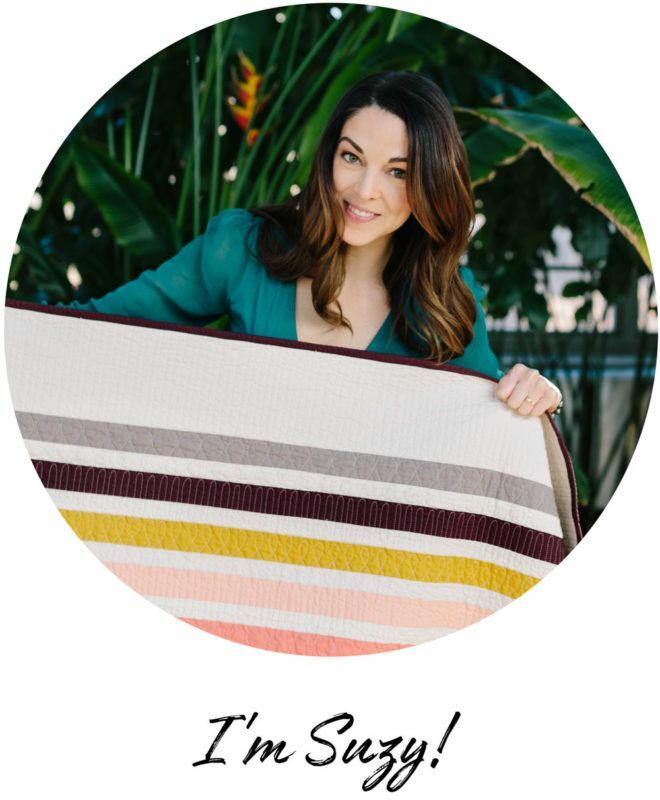 I have one knit tip for you – try to use 100% or close to 100% cotton. If you stray into the spandex or rayon blends, your fabric will get thinner and stretchier, and I don't think you'll enjoy working with it as much. 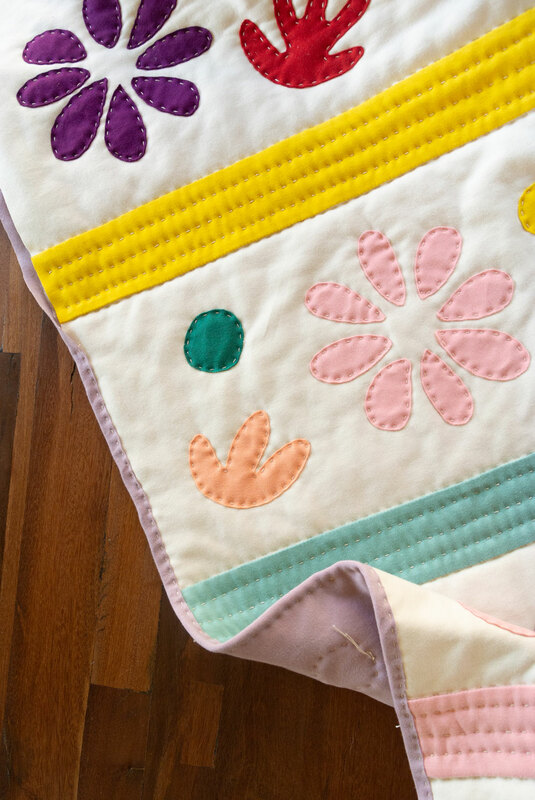 To make my knit quilt extra squishy and cuddly, I used Quilter's Dream wool batting. It's like wrapping up in a marshmallow, only sweeter. 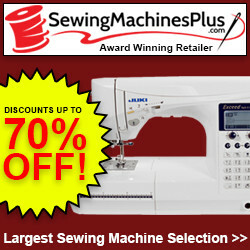 Don't have a sewing machine? Don't count yourself out! 1 1/2 yd. of two colors of jersey knit. In this example, Lais used Icy Mint and Lime. Knit scraps. 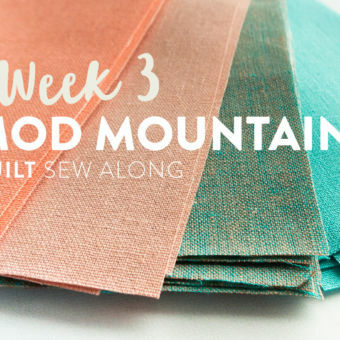 She used scraps left over from my Bohemian Garden quilt, so they are Birch Fabrics Teal, Forest, Cream, and Mineral. But this is where some fun experimentation can come into play. Do you have an old top you don't wear? Or maybe a collection of T-shirts piled high in the back of your closet? Use those! 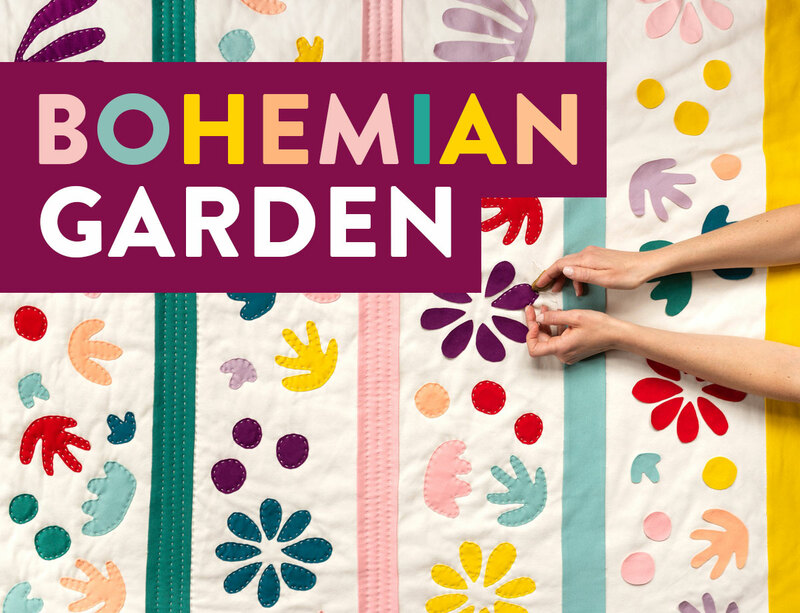 Grab the Bohemian Garden quilt pattern, watch the video series, and you're all set! 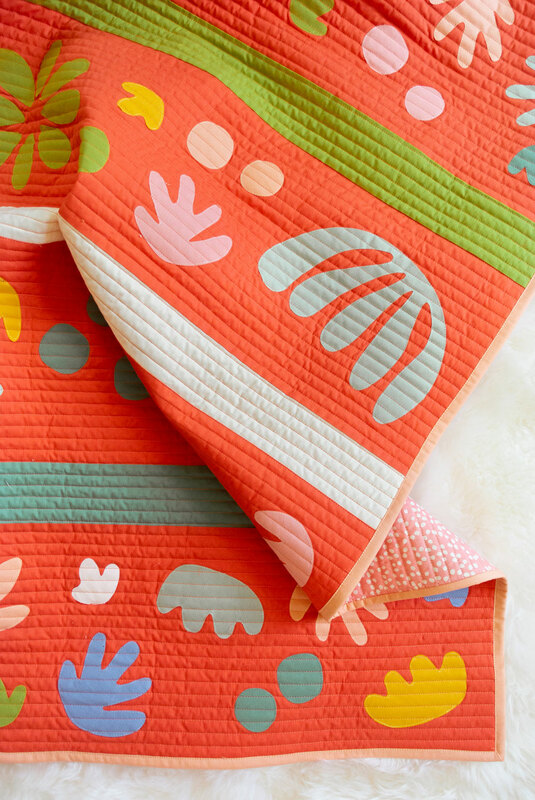 Shannon of Shannon Fraser Designs used quilt-weight cotton for your vibrant Boho quilt. If you're wondering why there is a seam allowance drawn on her appliqué pieces, it's because she is using needle-turn appliqué. Read this post for a tutorial! 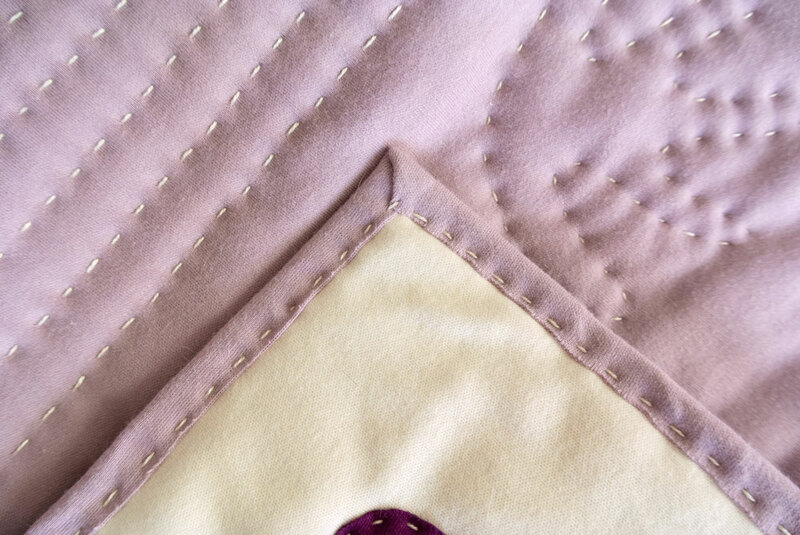 Christine made this elegant high-contrast whole-cloth quilt with quilt-weight cotton. 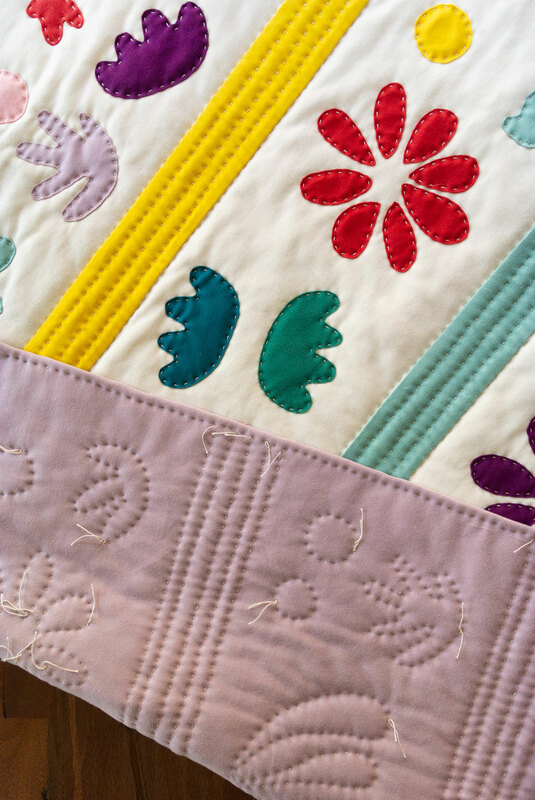 She quilted the three layers together first, and then appliquéd on top. 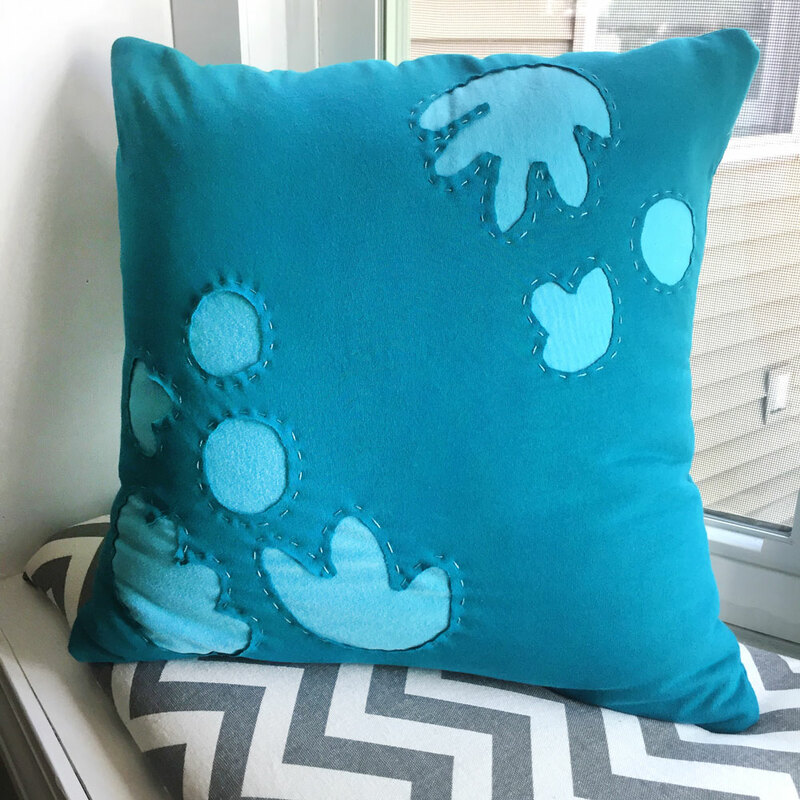 Jessica made super soft and cuddly knit pillow using only reverse appliqué! 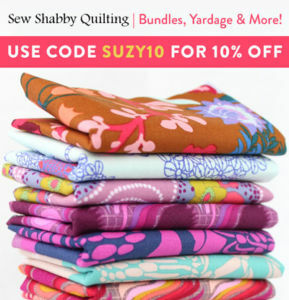 Love all of these versions, Suzy! Such an inspiring and happy design. 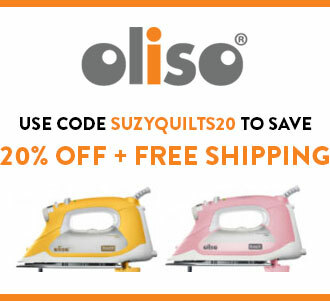 Perfect for summer time quilting! 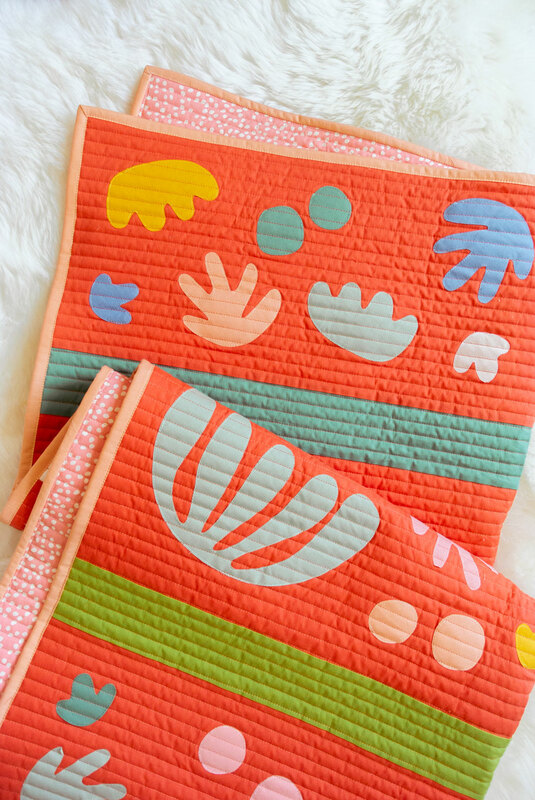 This must seem like a stupid question, but I’ve read everything I can find on this fantastic quilt, and cannot find out if the pattern comes with the templates for all the shapes. 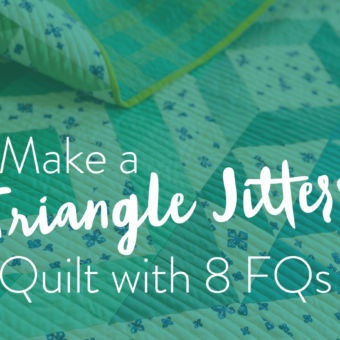 I see what looks like free-form cutting, but haven’t seen anything in your videos or information about the quilt that shows templates or shows anyone tracing around them. Please let me know. Thanks Suzy! Love all your creations.